Discussion in 'iPhone and iPad Games' started by Vovin, Dec 15, 2012. ▲▼▲ HALF PRICE to celebrate the launch of THE SHADOW PROPHECY Expansion!! ▲▼▲ A unique game of strategic matching and RPG battling! Place, match and thwack your way through dozens of gorgeous retro-style levels, a variety of game-modes and special hand-crafted scenarios. ** This game has ZERO consumable In-App-Purchases! - Just a pure gaming experience! 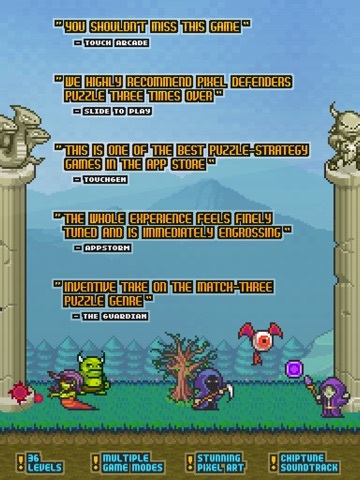 ** ▶ "you shouldn't miss this game" - 4.5/5 - Touch Arcade ▶ "We highly recommend Pixel Defenders Puzzle three times over." - 4/4 - Slide To Play ▶ "With loads of game modes, achievements and levels this is one of the best puzzle-strategy games in the App Store." - 4.5/5 - TouchGen ▶ "Clever and great value game" - 4/5 - The Sunday Times ▶ "this is much more than just another match-three puzzler." 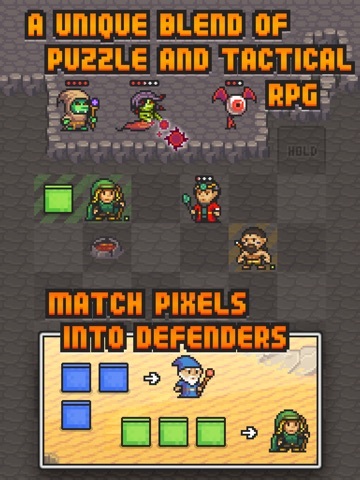 - 8/10 - EuroGamer ◊ Pixel Defenders Puzzle is an innovative hybrid of match-3-puzzler and RPG-battler. 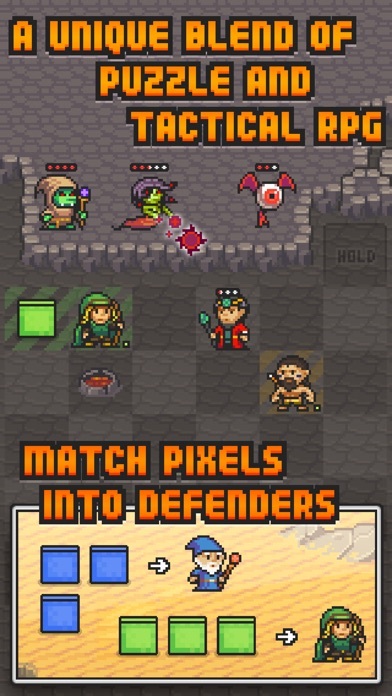 Match pixels to create Defenders and protect princesses, kings & queens from waves of fiendish enemies! 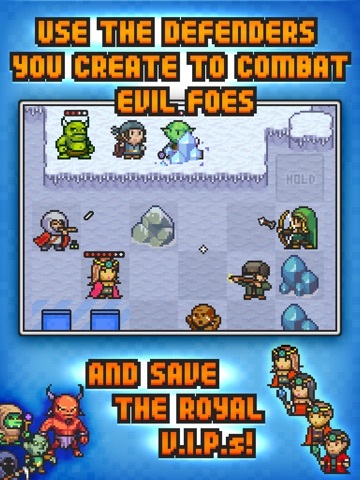 ◊ Strategically build a force of heroes to battle evil foes! 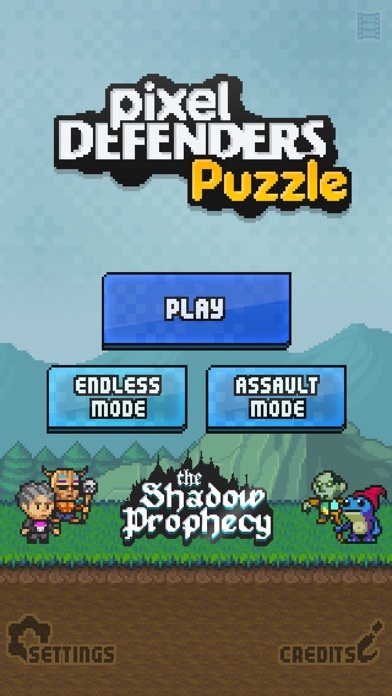 ◊ Test your wits in specially designed puzzle stages! ◊ Take on endless hoards of enemies in the action-packed Assault Mode! 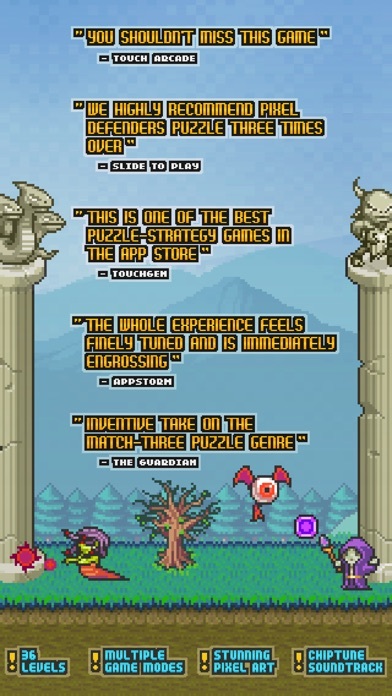 ◊ Put your skills to the test in Endless Mode: no enemies, just unlimited pixels to match and build your high score! ◊ 64 Achievements, and global high-score leaderboards! ◊ Face the ultimate challenge of the final boss battle! ... wait, what? Retro-fantasy-combat-match 3? This one looks good! Looking forward to hearing some impressions.. This looks fantastic. 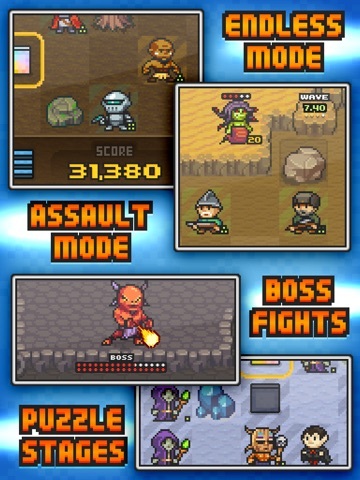 After a brilliant explained tutorial, a retro-music and retro-graphics gem is awaiting you, a mixture of Tiny Town and Match-3 elements, a deep strategic Match-3 with tactical RPG combat sequences is awaiting you. This is really unique and new. This looks and feels like a gem like 10000000. Puzzle fans shouldn't miss this!! Will leave my review and impressions soon! I'm likely to buy it on all of your recommendations alone, but short of doing so, based on the description and screenshots I can't quite tell what sort of game this is. I saw this early this morning, but didn't know if it was a good game or someone just had access to clean pixel-art. Be careful. Pixels are being overworked and underpaid. It won't be long before they unionize and go on strike. How many games do they have work in a single shift these days? This is Triple Town with a RPG spin. Don't bother thinking about it, just buy it. There is IAP but it is minor and is more about being able to buy more of the special blocks. Not necessary to play the game at all and you earn them by just winning levels too. Note for iPad users, it doesn't use the entire iPad display area. It is still native, but clearly hasnt been fully scaled to take advantage of it. Not even close to a gripe considering how good this game is. I downloaded based on the recommendations above from ppl that have been around for a long time. My advice is to quickly get this game before the Dev realizes that they should probably be selling this game for more than a buck. It's similar to triple town in terms of matching 3 items to make something stronger, than matching 3 of those to make something even stronger (ex. brown square makes a basic fighter, 3 of which makes a barbarian, 3 of which makes a you get the idea.). Different coloured squares makes a different type of character (ex. sorcerers, ninjas, etc...). Unlike triple town, there are no bears walking around. Instead there are waves of enemies that show up, who want to harm your VIP. The VIP you have to protect (like a princess) has a certain number of hit points. The enemies also have hit points. The defenders you make can be activated using Action Points (AP). AP are gained as you make matches. Then when you have enough AP's, you use your defenders to hit at the enemies (stronger defenders will hit for more). So basically you have to kill off the waves of defenders prior to them killing off your VIP. Anyways, I only played the tutorial and first stage, but have a suspicion that it was a well spent buck. 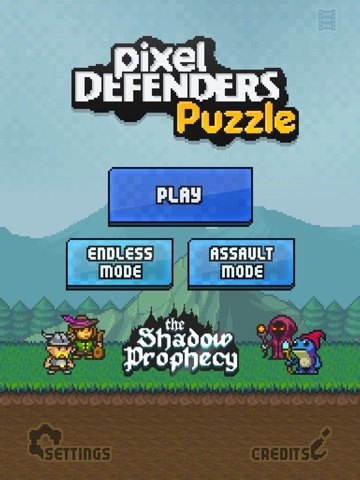 I'm definitely liking Pixel Defenders Puzzle a lot! 36 levels AND an endless mode? Plus, it's all for just $1... Mhm. If you are still not sure about it then just wait a few more Minutes till I`m done with the Gameplay Trailer of the first few Quests. It`s pretty much shows you a tiny bit of the hole Gameplay overall while the Tutorial was sometimes so damn dry that I needed an Drink while playing it. -Endless mode is a HUGE disappointment! Take out everything that made this a unique take on the Triple Tiwn genre (Baddies, Hero Abilities, and Action points) and you have the Endless mode. Basically their own take on a Triple Town, play until you run out of moves. -Buy your victory. 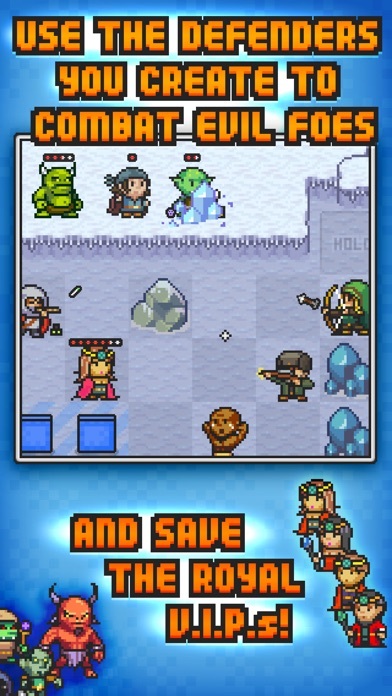 Just like Triple Town, getting a high score means either lots of grinding before hand in earlier runs to save up a bunch of items or simply spending some IAP cash to buy them, but unlike Triple Town, there is no upper limit on item usage per session. Dang, maybe they can change that in an update? I really want this game to be a huge success! The levels so far are great. Agree that the Endless mode is not as good as the regular levels, although it is slightly different than Triple Town. This really only applies to the Endless mode since it is the only mode that keeps a high score. My take on it is that there's the Real Game, which is 36 levels of uniqueness that so far I have yet to need to use IAP because the "highest score" you can get is 3 stars. This part is well worth the asking price of $0.99. Then they just added Endless Mode as an extra mode for those people that want something to do after they have 3-starred all the levels of the Real Game. My only gripe so far is that it's been too easy to get 3 stars, but I'm still early in the game. Actually...now I'm thinking about it. I don't care for Triple Town; god only knows how many clones there have been of that game. 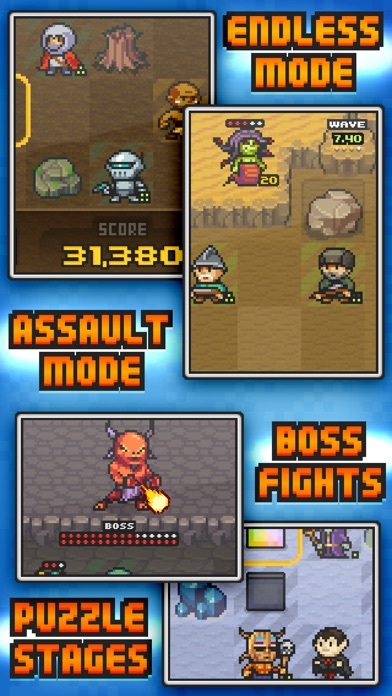 A retro Triple Town RPG Hybrid? I have little to say about this game right now except that so far - one level after the tutorial - it seems top notch!